USB modem + Wireless Router vs. MiFi Hotspot? My Cradlepoint router works fine to distribute mobile broadband from a USB modem around my house to various computers. Now I'm going to switch carriers, likely to AT&T because they have a 4G tower less thasn 2 miles away will likely increase my speeds beyond the dialup-like speeds of Virgin Mobile that I get from a tower 6 miles away. Should I get their Mifi (Evaluate) and trash the router, or just get a USB modem (Momentum) to plug into the router again? The USB modem was reviewed as being faster than the Mifi device. Comments for USB modem + Wireless Router vs. MiFi Hotspot? So sorry for the delayed response; I somehow let this one slip by! If you secure your MiFi with a password, it's as secure as your home network would be. So make sure you add a password! How secure is the mifi? Great question. For those who aren’t familiar with a Cradlepoint, or other similar router, it’s a wireless router that allows you to plug in a USB modem (and sometimes a PC card modem) and turn it into a hotspot. The net effect is essentially the same as using a MiFi Hotspot, which combines these two products into one smaller package. First, I have to say that a USB modem and a MiFi modem using the same cellular technology, including the same chipset and the like, should have the same performance on the same network. So it’s a bit curious that the USB modem got ratings for faster performance. As the speed of the WiFi connection is not a bottleneck here, both should perform the same all else being equal. Even if multiple people on the forums have tested both side-by-side, that doesn't make for statistically significant results. So with that said, and assuming that’s actually true (that they both have the same speed), I think it comes down to a personal preference. 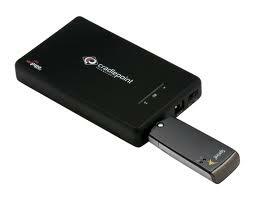 Personally, I like the smaller size of the MiFi device compared to managing the Cradlepoint plus USB modem combination. Also, if you’re travelling a lot with it, it’s much easier to stick a MiFi hotspot in your jacket or pants pocket compared to a Cradlepoint with a USB modem sticking out. When the cost of buying a new modem (USB or hotspot) was much higher, and when USB was more expensive than a hotspot, buying a Cradlepoint would allow you more flexibility to upgrade to a new, less expensive USB modem and still use your Cradlepoint (assuming the new modem was supported). With pricing as low as it is now, upgrading any type of modem is cheaper than buying a Cradlepoint and modem. That said, since you already have one, this point doesn’t really apply. You’ll also want to compare the battery life of the two devices. If you’re mostly at home, it won’t matter, however, if you’re using it mobile a lot, this will be an important factor to consider. Another point is that the router is essentially managing the USB driver and login process. While I understand that this has improved over time, there’s still an additional point of failure introduced by having to manage that process, and worrying that a newer (or older) modem isn’t supported. I haven’t personally used a Cradlepoint though, so I can’t speak well to whether people experience a lot of issues with the login and authentication process. Lastly, by having the USB modem, you have more flexibility using it with a desktop PC if that computer doesn’t have WiFi built-in to access the MiFi hotspot. Most PCs have this, but I don’t know your specific circumstances. Overall, depending on your travel needs, and assuming a new USB modem is compatible with what you have already purchased, it may be six of one, half a dozen of the other. For me, I would just go with the MiFi device and keep buying new ones as I need them (i.e. as newer, faster ones come on the market).